Opening with a breathtaking zoom where the Peruvian foothills dwarf a party of Spanish conquistadors as they descend from cloud into rainforest, this account of their search for the lost gold of the Incas was reportedly written in a frenzy and whose shooting, involved a shooting. Werner Herzog’s 1972 masterpiece certainly warrants this new transfer and re-release into cinemas by the BFI. As with Coppola’s Apocalypse Now, which it inspired, the decision to film on location pitched cast and crew deep into the menacing jungle. Cinematographer Thomas Mauch’s wandering hand-held camera captures the long journey down the tributaries of the Amazon, which become as much a character of the expedition as its crazed leader, Klaus Kinski’s Aguirre. Danger is ever evident as water washes over rafts, muddies costumes and obscures the lens. Epic, mystical and entirely in awe of nature, the film drove those involved to mirror the descent of the narrative into madness. 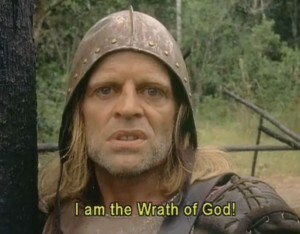 Offscreen, Kinski reportedly shot at an extra and, though Herzog as always denied it, was later cajoled into performing by the director at gunpoint. Whatever the truth, this is an unrivalled and astonishing voyage – into storytelling, cinema and the very heart of darkness.